Over on PCGamesN, there’s an interview with CCP Shanghai Senior Director Snorri Árnason, who goes into sometimes-painful detail about what went wrong with Dust 514 and how things will be different with Project Nova. In large part, the interview comes off as sounding like Dust was planned as too ambitious, with too many moving parts than could be effectively managed and implemented. The much-ballyhooed interaction between Dust 514 and Eve Online — especially the ability to call in orbital strikes — never really developed like it should, and was more of a “selling point” than anything else. Despite the decline of the PlayStation 3 and rise of the PlayStation 4, Árnason doesn’t think Dust on PC would have fared much better. 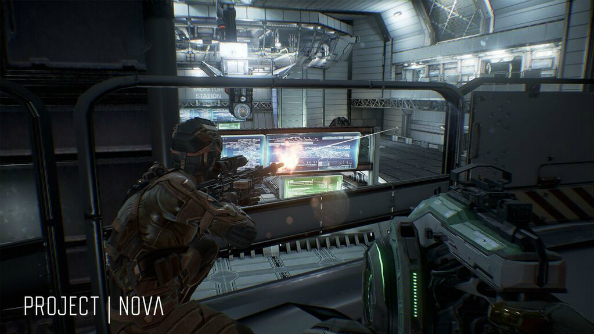 Project Nova looks to be a more self-contained game, feeling like Eve without being shackled to CCP’s iconic MMORPG or requiring a connection to it to get the full experience. The whole Dust 514 concept and execution never felt right to me or practically anyone I knew, so it’s good to see CCP learning from the experience and making something with a much higher chance of success. It failed because CCP failed to listen to their Eve player base when it was suggested to make it PC based just like Eve. The rest of the excuses are just a superficial dog and pony show where they place the blame elsewhere instead of admitting they didn’t give a damn what their players say. is they are in Iceland. …its too bloody cold and they can’t break any ice to escape it! So therefore CCP freezes and so do their any ideas as they are wrapped up in blankets,..
You do know that Iceland has an Ironic name cause it is mostly “green” with plants. Have you seen their studio location? It looks nice out. What CCP said is a bunch of pure grade BS, the reason it failed, is because they literally said they were not going to support it anymore, which caused a massive slide of players out and that was at fanfest during when the game was supposed to be mid cycle. Not only that but they were completely tone deaf to bugs, along with complaints, they promised features they never planed to impliment. It took more then 2 years to just add daily quests/missions, to a lot of people Dust 514 is toxic to even mention. They did not even bother fixing bugs that they should have been till after they had already milked all the money they could out of the game. Half the time they did not even know what pricing structure they were going to use, and oh yeah, they did a massive bait and switch several times. Dust 514 failed purely due to CCP being just plainly horrid in so many ways.